The Confetti High Five showers unsuspecting guests in confetti when your two hands come together. Celebrate in style with the quickly reloadable cannon. The FiestaFive comes with 6 confetti cartridges that slide into the top. This confetti shooter is 100% safe, allowing you to expel raw force with your next handshake and surprise friends, family, and coworkers at your next celebration. 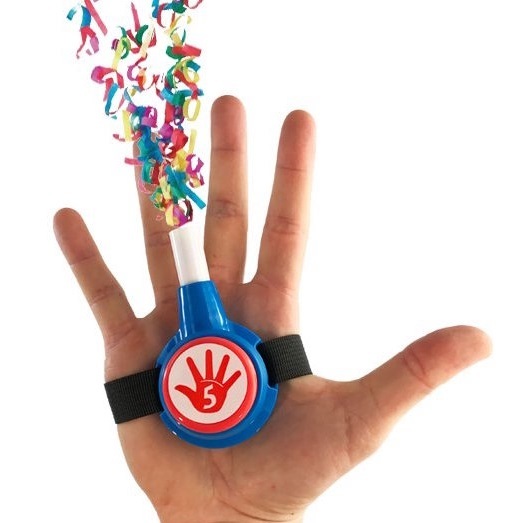 Years of research and thousands of trials with perfect high fives have gone into producing the highest quality product available. Put the party in the palm of your hand anywhere you go. Perfect for gift exchanges, stocking stuffers, holidays, birthday parties, weddings, and more! Celebrate the end of a presentation or closing a deal with a bang. The FiestaFive is always safe in your palm, pocket, and while traveling.